“A Guide to Bliss” by Shai Tubali introduces the reader to the White Light Expansion Method. By using this method, we can free our minds to expand into broader states of consciousness by breaking through our mental limitations. By combining meditative and psychological techniques, we can apply these into areas of our lives that are affected in the area of subtle fields. While this might sound complicated and mind boggling, the author’s words flow on the pages making the material easy to follow and to understand. Initially, I expected to find myself mentally bogged down by the process, but instead I actually felt like my mind was expanding as I read. The book also seemed to take on more of a “light” appearance to me. I found this aspect of my experience to be absolutely fascinating, and I also feel it helped show me I was on the right path. By following this process, you will develop skills for coping with your mental and emotional world. You will also gain the ability to “touch the universe,” no matter where you are. The author describes expansion as, “a tool for ecstatic navigation throughout the depths of consciousness.” To achieve this, he discusses the expansion of the seven chakras in this process. The Theory of Subtle Fields and Spiritual Enlightenment is also explained. As each major area is addressed, there is a section offering steps to experience what is being taught. These steps are listed under “Practice” towards the end of each chapter. There are also sections where people who have gone through the process share their experience. 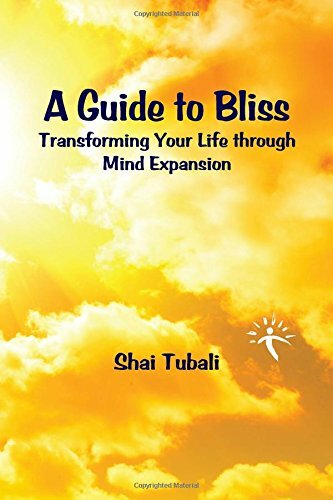 I feel so lucky to have been able to get my hands on “A Guide to Bliss” by Shai Tubali. I feel like it came into my life at the perfect time. I love how the author’s gift for writing allows his words to flow so I quickly felt like I was part of the process and not just an observer. I think, “A Guide to Bliss” would be one of the best gifts with which you can treat yourself!